That answer is perhaps not so black and white as comic book movies and spoon-fed kiddie fare might have us believe. Yimou Zhang’s recent Hong Kong masterpiece Ying Xiong (or literally, Hero) is a complex tale of assassins and kings that examines and dissects contemporary notions of courage, valor and justice while managing to be a spectacular visual feast. Though the movie is in fact a Hong Kong financed production with Mandarin Chinese as the spoken language, North American audiences will certainly recognize several of the stars. Foremost among these is Jet Li, who has broken into the Hollywood mainstream with recent films such as Romeo Must Die, The One and Cradle 2 the Grave. He’s even more appealing in Hero as “man dressed in black” Nameless, a mysterious character who manages to merit a meeting with the King of Qin by defeating several potential assassins. This trio of assassins is played by the slightly-lesser-known Donnie Yen, who was most recently seen stateside in Jackie Chan’s Shanghai Knights, along with the lovely Maggie Cheung and her frequent co-star, the remarkably emotive Tony Leung (winner of the 2003 Hong Kong Film Award for Best Actor - but for Infernal Affairs rather than Hero). Adding to the wonderful casting mix are recent Academy Award nominee for supporting actress Ziyi Zhang and Daoming Chen, who portrays a conflicted king with mastery. Amazingly, despite some noteworthy performances from all of the players, the actors are really only a very small part of the big picture, so much so that they’re almost a kind of window dressing in the grand scheme of things. The real “stars” of the film are its extraordinary visual effects and striking art direction. Still, though Hero is the very definition of “eye candy,” the film isn’t an just empty vessel with lots of pretty pictures. Instead, director Yimou skillfully combines the beauty of an impressionist painting with a story reminiscent of Shakespeare for a sweeping epic that never feels overblown or exaggerated. As the movie envelops you, it’s impossible not to be affected by the use of color. When black is the color of choice, it evokes strong emotions. Accenting both Nameless and the King of Qin’s ambiguous characters, black is a color of evil in China, yet it is difficult to determine where the real “evil” lies here. While black is used intermittently to make a clear impression, it’s the other colors that provoke sensory pleasure and contemplation. White, the color of death in China, is vital to the film’s progression and fairly revelatory and foreshadowing of certain plot points. Likewise, red (a sacred color that denotes vitality), green (emphasizing growth) and blue (the sky and heavenly blessings) are almost characters in their own right. The gorgeous makeup and costume design only serve to highlight the resplendent bounty. Actually complementing the colors and vivid artistry present throughout the film is the exquisite martial arts choreography; however, this action is far from typical. Rather than being hard-hitting and acrobatic, the kung fu and wire work are dreamlike and almost otherworldly. Every single one of our performers has the opportunity to shine brightly as they are all highlighted in a fight scene at some point or another. Of course, the visual display wouldn’t even be possible without the always-special cinematography of Christopher Boyle. It’s rather unusual for a cinematographer’s name to stand out as recognizable, but I can definitely say that I was thrilled to see Boyle’s name in the credits. It is to his credit that Hero has the look and feel of a transcendent other-world. 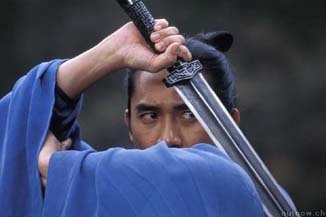 Even though the music isn’t particularly unique (we heard the same persistent drum beats throughout Crouching Tiger, Hidden Dragon along with any number of martial arts staples), it is memorable and perfectly in keeping with the atmosphere of the film. Early on during a fight between Nameless and Sky (Yen), the musical accompaniment is in fact vital to the progression of the plot, and in that portion of the movie it works extremely well. The elegiac end piece is also particularly poignant. Overall, that score works well with the sumptuous visuals and the cryptic story, as all of the cinematic elements combine for a movie-going experience that feels more like watching a sculpture being molded or a painting slowly unfolding than actually sitting down and viewing a simple film. It will probably be viewed by many as simply Crouching Tiger, Hidden Dragon II, which is unfortunate, because Hero is really the deeper and more profound work. Hero holds up even better on repeated viewings, because ultimately, the question of what makes a true hero is answered in each person’s own mind. And no two answers are likely to be the same.